5am, Bendigo. The alarm jolts me awake and I leap into action. There’s no time to spare. The removal van arrives in an hour and though Mum, her husband and I have been packing for weeks, the final part of the process requires absolute focus. It’s been pouring rain all night and, aside from our furniture getting wet, the roads on the long journey are bound to be dangerously saturated. Without saying a word we know that things aren’t going to go smoothly for our three vehicle convoy to New South Wales. We’re all quietly uneasy. After thirteen years in Bendigo my mother’s moving interstate to be close to her daughter and grandchildren (my sister and nieces) in Albury. It’s taken a year to orchestrate and today is finally D-Day. Though the sun is yet to rise, we’re all up and scurrying around the house with nervous adrenalin. We each execute our last-minute tasks with military precision; beds are stripped, mats are rolled and the kitchen’s cleared. The phone rings and from the bathroom I hear my mother answer. Mum: Which route am I taking? Well I’m going to go via Violet Town, you think via Shepparton’s better? 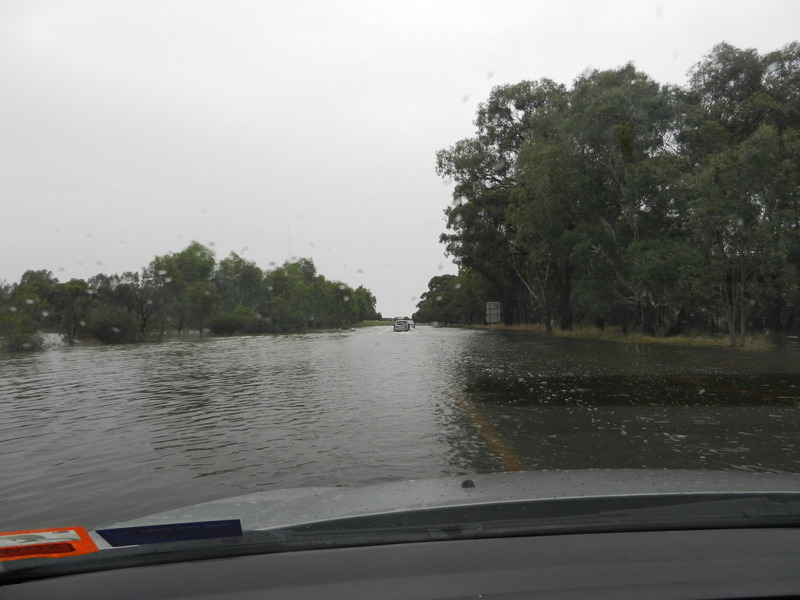 I’m sure the connecting road to Benalla’s already under water but I’ll check the road traffic report. I’m hoping the Violet Town route will still be okay. I can’t hear the caller’s response, though it’s clear she’s talking to the removalist. Mum: Do you have any plastic sheeting we could use to protect the carpets? Again, I can’t hear anything. Mum (irritated): No, I don’t mean sheeting for when we arrive, I mean for here! Otherwise we’re going to leave the place covered in mud! The conversation goes back and forth in this manner for almost ten minutes until I hear my mother bark. Mum: Oh bloody hell, Steve – I thought you were the removalist! I’ve got to go and get on with things! My father (my mother’s ex-husband) had phoned to check if we were ready for the move. It was when he let her know that he’d been up all night with diarrhea that the penny finally dropped and she realised he wasn’t the removalist. I can’t stop laughing (at both of my parents), to my mother’s exasperation. No, today isn’t going to go smoothly. After loading our belongings into the van and two cars, we head off in the ceaseless rain. 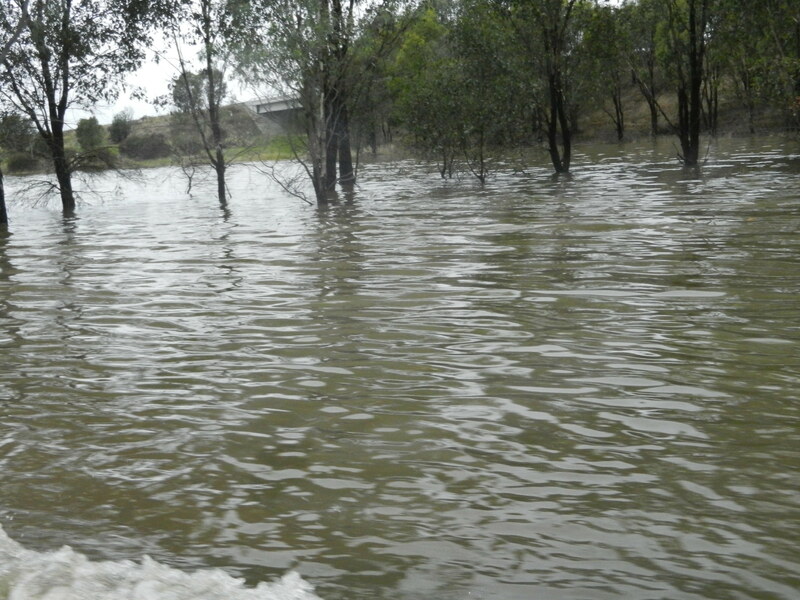 Roads will be cut off due to flooding, but we can’t be sure which. For three hours we head through roads gushing with water, getting diverted when it’s two feet or more. We breathe a sigh of relief when we make it to the Hume Highway. It’s a major four-lane highway and has never flooded. Until now. An hour from our destination, police cars signal us off the road. Lorries and four-wheel-drives may proceed but cars are told to turn back unless they must travel north. We stop, while ahead we see the removal van continue to our new home – with no house keys to enable them to unload. The pounding rain reflects my mood. With water increasing around us, we wait for a diversion to be put in place – we may be here overnight. After three hours, my bladder can wait no longer. Between two open car doors I squat with a blanket over my head. Sigh. Today has gone from one high to another. Though now it’s time for my mother to laugh at me, to my exasperation. 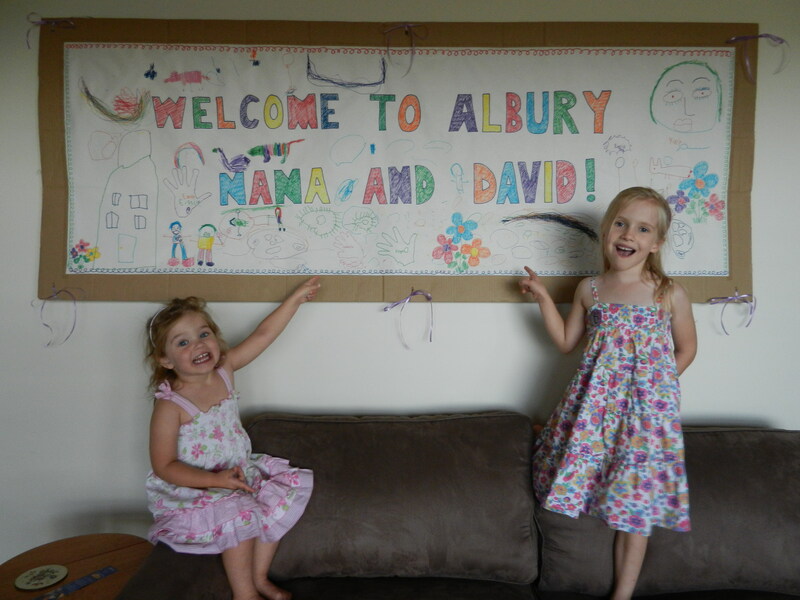 In another hour we’re permitted to journey via a massive diversion and we arrive in Albury where we’re greeted by my sister and her family. My brother-in-law’s offer to help is declined by my mother. “No, it’s okay, we’ve got Simone for the heavy lifting”. Everyone laughs as I heave a suitcase from the car. Giggling with uncontrollable joy, my nieces welcome us with a giant handmade poster. Their happiness is contagious and, though the sky is grey, it feels like the sun is shining in our new home.